What are the advantages of epilation using oriental wax compared with classical wax? Thanks to the Oriental wax, the hair regrowth is finer and is rarefied because the root of the hair is torn off. This waxing is recommended for people with circulatory problems because there is no heat and the repetitive movements of pressures and releases made from bottom to top performs a real draining massage, good for circulation. Indeed, it promotes venous return and fight against heavy legs. Waxing with oriental wax is a care that has the effect of a scrub on the skin i.e. removes all the dead cells present on the superficial layer of the skin. The skin is smoother and softer. In addition, this scrub eliminates hair under skin by removing them. This Oriental wax is 100% natural and ideal for sensitive skin, even the most sensitive: no risk of burning with this warm wax. Moreover, Oriental waxing is a safe method because it comes from the Middle East and dates from before the Middle Ages: that is to say, it has proved its worth! 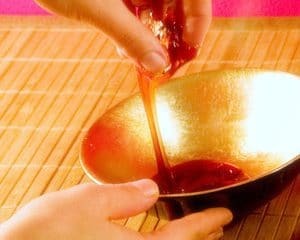 Waxing for women: It is still used today in the countries of the Maghreb and the Middle East: Eastern women regularly depilate in this way especially on the eve of their wedding. This method tends to be extended to other women in the world and mainly in Europe. Oriental waxing needs a certain length of hair to be effective or it must be done every 6 to 8 weeks to avoid leaving a small fine hair or nascent hair. The classic hot wax is very effective. It is the most used method of depilation in the institute. It removes all types of hair from the thinnest to the thickest, from the shortest to the longest. The heat allows the pores of the skin to expand so that the hair can be removed more easily. Since hair removal is effective even on short hairs, you do not have to wait long to regrow hair, or a hair removal can be done every 2 to 3 weeks. Hot wax, as its name suggests, has a risk of burning the skin and the hair under skin. You risk some temporary itching, a local depigmentation for a few days, or some red traces … Nothing serious, but nothing very pleasant either. If you suffer from heavy legs or you have blood circulation problems, avoid hot wax! If waxing with hot wax is performed too frequently, you risk developing hair under skin. In conclusion, with these methods the hair always ends up re-growing, so if you want to get rid of it permanently consider depilation with pulsed light, and finally get rid of your hairs at more than 90%.